For thousands of years, Native Americans from all over the continent have journeyed to these sacred lands to quarry for "pipestone" -- the rare red stone from which prayer pipes ("calumet") are carved. An ancient legend among native tribes tells that the soft red stone came from the flesh and blood of their ancestors -- granting the red pipestone a high level of sacredness which commands respect. Long before the first Europeans arrived in this area, tribes from all over North America would travel hundreds of miles to obtain the prized red stone. Their peacepipes (another word for prayer pipe, or calumet) took on many shapes, styles and designs, and were used in vision-questing and other spiritual ceremonies. Today, the ancient art of pipe-carving continues. Tribal people still hand-quarry the red stone with picks and chisels, and continue to carve pipes and crafts which are unmatched in quality and originality. It is truly an art that deserves preservation. For countless generations, American Indians have quarried the red pipestone found at this site. Home for the historic Pipestone quarries, beautiful tallgrass prairies, and the majestic Winnewissa Waterfall. Located inside the Pipestone National Monument, the Pipestone Indian Shrine Association is a non-profit organization dedicated to preserving the Indian art form of pipemaking. Today, local pipemakers continue to quarry pipestone and create pipes and crafts. Pipestone cultural demonstrations May through the end of September. Home of the largest peace pipe, The Keepers Gift Shop and Gallery is located in the Rock Island Depot, and is filled with pipestone, pipes, beads, leather, and American Indian Art. 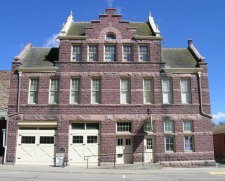 Located in the Old City Hall Building built in 1896. Self guided tours through four galleries of exhibits ranging from geological history, Native American history, pioneer settlement, and general history of Pipestone County. Our pioneers left us a legacy in stone. From the quarries nearby craftsmen obtained plentiful supplies of native Sioux Quartzite which they used for building. These buildings were constructed primarily from 1880 to 1900. Many of these buildings remain for our admiration today. While enjoying your walk, stop in at any of the several stores and shops along the way. 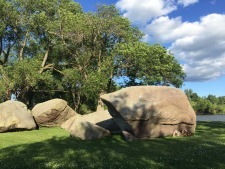 These large granite boulders have long been known as the Three Maidens. With smaller fragments, they once formed one large single boulder some 50 feet in diameter. The boulder was deposited by glaciers. 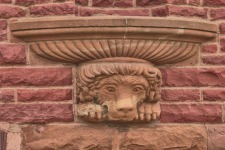 These are various legends regarding the Three Maidens, a popular Pipestone landmark. 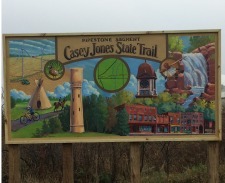 This multi-use trail begins near the intersection of Hwy 23 and Hwy 75 on the North side of Pipestone. This paved trail is great for running, walking, and biking. In the winter the trail is groomed and excellent for snowmobilers. A full size replica of a working fort with a beautiful cedar log cabin gift shop and museum in the center; which features handcrafted American Indian crafts, souvenirs, gifts, beautiful Carlson Indian Dolls, many ceremonial pipes and pipestone crafts. 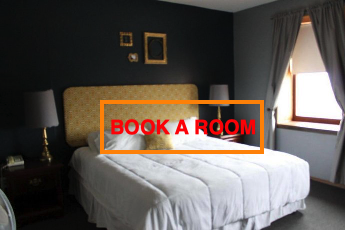 Open May - Mid October. 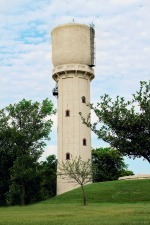 The restored tower also marks a welcome rest stop area, complete with picnicking and restroom facilities and R.V. dump station. It is located on 2nd St NE, only two blocks west of Highway 75. The 132-foort structure, designed by L.P. Wolff of St Paul, is one of only two in existence. A near twin is in Brainerd, MN. 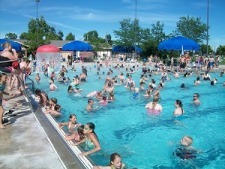 Pipestone's Family Aquatic Center offers lots of family fun and great features including: 126 Foot Flume Water Slide, 22.5 Drop Slide, Raindrop Waterfall, Zero Depth Entry, Kiddie Turtle Double Slide, 2 Sand Volleyball Courts, And So Much More!! Swim, fish, or boat the waters of Split Rock Lake, the largest body of water in Pipestone County. The lake is the predominant feature of this park. Of special interest to visitors are the Sioux Quartzite stone dam, bridge, and outcroppings. Stop by the Beach Side Trail Center for an excellent vista and to discover more about the area. All campsites at this park are able to be reserved. Located 7 miles south of Pipestone on Highway 23.